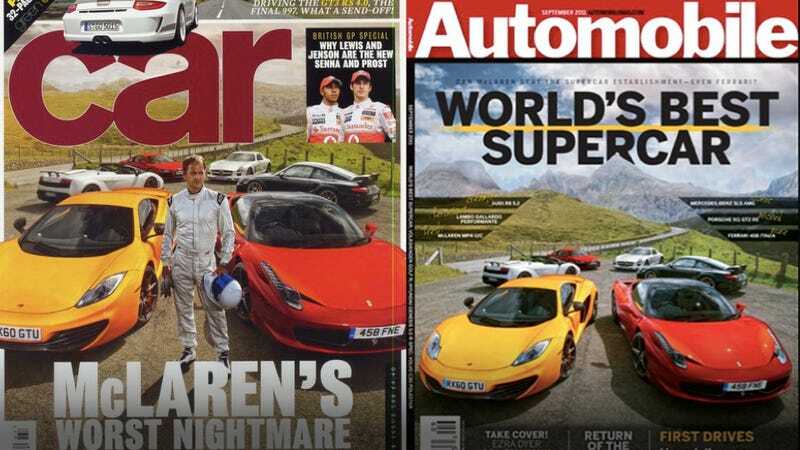 How did three unaffiliated car magazines all end up with the same cover? Who's copying whom? Is there some, secret collusion among the US's Automobile, the UK's Car and Germany's Auto-Bild: Sportscars? Nope. It's just business. Running a car magazine isn't easy. I should know. I used to run one. Ad revenue is down, readers' attention is split a million ways and standing out on a crowded newsstand means bringing in "spectacular" stories. But your budget's down too. How are you going to handle the logistics of assembling six or seven $200,000 sports cars, along with writers and photographers for a burn though the Black Hills of South Dakota? And for what? To move the readership dial by 100, 200, or 1,000 readers? There's another way, and here's how it works. Road test editor of Car, Ben Barry and photographers Greg Pajo and John Wycherley's put together a bangup comparo piece — with a supporting cast of high-end sports cars — which ran in the July, 2011 issue of Car under the headline, "McLaren vs. The World." Because the writer and photogs retain the rights to their work, they enlist the services of a syndication house like Fox Syndication, which pitches the text and photos to an e-mail list of potential buyers, that is, primarily magazine titles from around the world. I've been there. The clock's ticking, your issue's budget is dwindling, and you've only gotten half of your feature well (comprising all of an issue's feature pieces) in place. So you find yourself looking through a gorgeous set of photos of Porsches and Ferraris and a bright-orange Macca, speed-blurred against the Welsh countryside. Next thing, you're on the phone negotiating a (very reasonable) price and brainstorming headline ideas. But buying a cover story? That kind of thing is, obviously, way trickier. When I was at 0-60, we were very sensitive about putting articles we'd bought from a syndicator on a cover. The credibility hit of a duplicated newsstand photo was, for us — a bunch of wide-eyed editors struggling to establish ourselves in a messy market — too risky, and an emergency option only. It worked once, however, when we'd gotten a first comparo of the Ferrari 458 Italia and Porsche 911 GT3 RS (Words by Chris Harris, photos by Jamie Lipman. Jamie and Chris did shoot us a special cover for our very own.) It sold great, but didn't endear us to either our colleagues or Ferrari, which had its rules for when a magazine could post a comparison. Screw them; we had a magazine to run. Is it a big deal? No, it's not. Magazine editors-in-chief are a vain bunch and view such things as a hit to their credibility among their competitors. With diminished budgets, it's a priori to use your resources on a few exclusives that are your bread-and-butter. The rest? If you don't have the right-sized team, you've got to fill out the book the best way you can — because you should be finding amazing pieces for your readers to read — no matter if it was made in-house or not. Can a great-looking, well-written pickup piece from an alarmingly literate British writer contribute more to your magazine than you might lose from a well-traveled reader spotting a double-up? Yes. But maybe you should change the splash image you're slapping on top of your magazine cover. You know, so you don't look silly doing it. And maybe, just maybe, you don't try to photoshop the Alps in the background. Remember this, reader, the next time you're browsing an urban newsstand with a global selection of car magazines. The world is smaller than you may have thought.